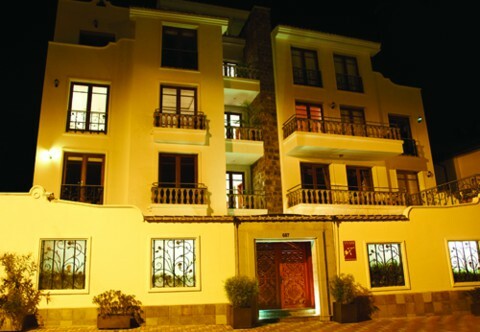 Anahi Boutique Hotel Quito is a charming Bed & Breakfast emphasizing the value of traditional service for the most demanding guests. Its style and philosophy go hand in hand with a strong concept of Ecuadorian identity, based in the history, regions and richness of Ecuador. It is located only 10-15 minutes from Quito International Airport in the lively neighborhood of Barrio La Mariscal, also known as 'The Zone', surrounded by the best gastronomic, cultural and leisure places in the city. The decor is all Ecuadorian with touches of art by Ecuadorian artists, combined with the latest interior design trends. Each suite has been specially designed to emphasize the history, the different regions and the culture of Ecuador. Anahi has all the facilities of a modern hotel, where tranquility, personal service and privacy are paramount. There are seven king-bedded rooms and seven rooms with two queen beds. There is one room on the third floor (Amazonas Room) with two king beds. The smallest room (Vitro Fusion Room) is 198 square feet, and the largest room (Etnos Room with two queen beds) is 357 square feet. Most of the rooms average 234-312 square feet. All areas are non-smoking. The Orquidea "Orchids" Restaurant, with a capacity for 30 guests, is open from 7 to 10 am in the morning for breakfast and from 6 to 10 pm in the evening for dinner. Service at other times can be provided upon request. A buffet-style breakfast is included in the rate. There is self-service tea and coffee at all times on the terrace. Room Service is available 24 hours with the Express Menu.